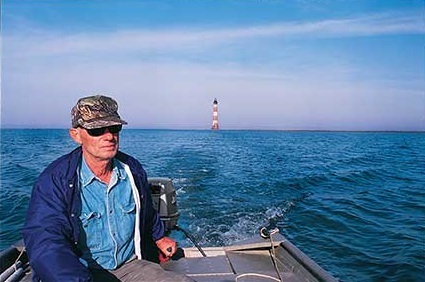 Established more than forty years ago to oversee the wise use of the Palmetto State's bountiful coastal resources, the DNR's Marine Resources Division has done just that, with some notable successes. "Prettiest sight I ever saw," said 82-year-old fisherman Johnny Ohlandt, remembering the first red drum he caught as a child, fishing with his father with a hand line on Folly Beach. Hooked for a lifetime on this now popular angling species, over the ensuing years, Ohlandt has caught many, many more of the fish he still refers to simply as "bass." As the human population on the coast started to increase, a growing number of anglers learned, as did Ohlandt, to target his favorite fish in estuaries, not just in the surf. This greatly increased fishing pressure caused red drum populations in South Carolina to decline dramatically. Now this popular game fish has rebounded, thanks to years of research that led to sensible regulatory changes to limit catches, plus effective educational efforts that changed public expectations - just one of many biological success stories the S.C. Department of Natural Resources' Marine Resources Division has had over the last forty years. Successful management of any species begins with learning the life history of that animal. 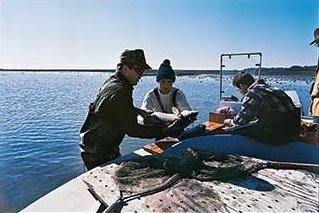 DNR biologists, led by Charlie Wenner and Bill Roumillat, first began sampling red drum in the 1980s. 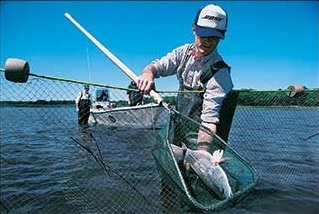 Using a variety of techniques and sampling gear, primarily trammel nets, which catch fish without harming them, they gradually began to piece together the life cycle of this highly sought after fish. They also aged red drum of all sizes using a small ear bone called an otolith. Using federal grant funds, Marine Resources Division staff began a detailed assessment of red drum and other inshore species, including trout and flounder. They learned that red drum in South Carolina can live at least thirty-seven years, spawning offshore throughout their adult lives. Protected by size limits and their inaccessibility to most fishermen, adult red drum can spawn for decades. The resulting larvae drift on the tides into marsh creeks where they find abundant food. They stay inshore for three or four years, growing eventually to eighteen to twenty-four inches. 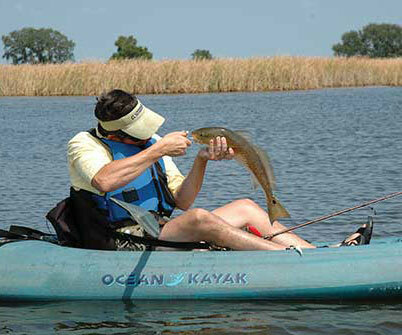 But inshore anglers have easy access to these young fish, often abundant in large schools and not difficult to catch. 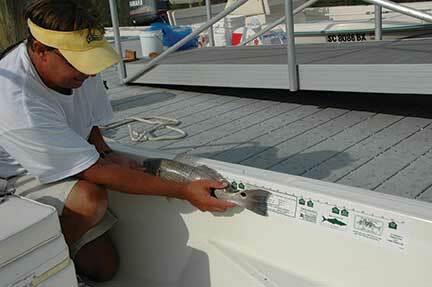 Tagging studies showed juvenile red drum have small home ranges, moving little from creek to creek. So a hot fishing spot this week probably will remain hot for months. Back in the 1970s and 1980s, anglers caught mostly twelve- to fourteen-inch fish, primarily in the fall, just as they reached a year old. When cold winters pushed the fish into shallow water they fell easy prey to "graining," the local term for gigging. The overharvest of small red drum, either by hook and line or gig, kept those fish from ever reaching the offshore spawning waters. 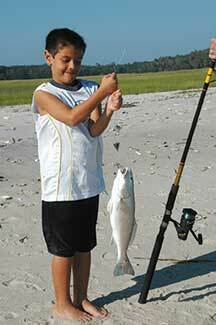 This growing fishing pressure on under-aged fish hammered the red drum population. 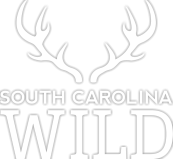 "Dead fish don't spawn," Wenner likes to say, and that message, presented by Marine Resources Division staff for years to countless anglers at saltwater fishing clubs all across the state, began to resonate, eventually all the way to the South Carolina General Assembly. "Once we determined the need to reduce the harvest of red drum until the stock recovers, the department sought assistance and advice from the Coastal Conservation Association and other organizations to build support for legislative action," said Marine Resources Division Deputy Director Robert Boyles. With size and catch limits enacted by the General Assembly and modified as necessary over the years, red drum began a slow recovery. Based on the knowledge of the fish's life history obtained through years of sampling, tagging and aging research, these new management measures began to reduce the catch of under-aged and under-sized red drum in estuarine waters. This allowed more fish to survive to maturity and escape to offshore waters where they could spawn. 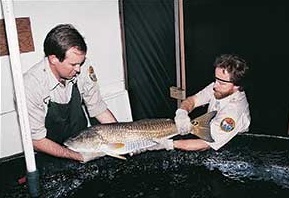 In addition, MRD researchers in the 1980s began to develop methods to spawn red drum in captivity and raise them to juveniles, using facilities at the Marine Resources Center in Charleston and at the Waddell Mariculture Center in Bluffton. For ten years, beginning in 1995, they released several million fingerlings every year in estuaries along the entire coast. This stocking resulted in an increase in angler catch the following year by 10 to 20 percent, depending on the estuary and the water temperature at the time of release. Researchers attempted to gain a better understanding of red drum, from developing successful techniques for captive spawning to understanding "bottlenecks" that might impact red drum abundance. A key breakthrough came when, using just a small fin clip, scientists learned to distinguish the DNA of cultured fish versus wild fish. Today they can still trace the offspring of these stocked fish back to their cultured parents. 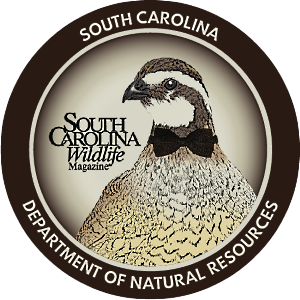 Wildlife biologists throughout the country now apply the DNA research advances developed in the red drum aquaculture and stocking program to learn more about other species from striped bass to white-tailed deer and wild turkeys. The Marine Resources Division's genetics lab, with its state-of-the-art equipment and highly trained staff, has no equal in the Southeast. 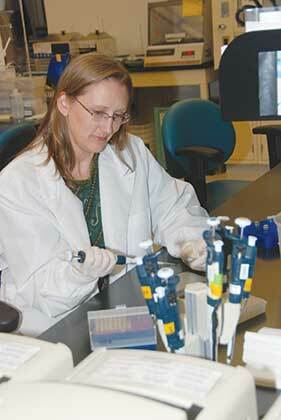 Division researchers also apply these same genetic techniques to many other species of fish, as well as shrimp, crabs and shellfish. In recent years, Marine Resources Division scientist Steve Arnott has layered genetics information with sampling results from estuaries to areas farther upstream and offshore. Combining all this with angler catch information, he and others have developed a comprehensive long-range picture of the red drum population, which they have discovered undergoes a cyclical pattern in annual spawning success. Some years, very few juvenile red drum enter the inshore population due to a variety of environmental conditions not yet completely understood. But now, with well-researched management practices in place, most anglers do not see much change in their success rate even after poor spawning years. Without size and catch limits to protect young fish during such annual fluctuations, red drum populations might well have declined dramatically in the past twenty years. Instead, the population remains stable, and perhaps has increased, despite the occasional poor spawning year. In conjunction with these scientific advances, stabilizing the red drum population also required educational efforts beyond just informing anglers of size and catch limits and the reasons behind them - the DNR had to change angler expectations. Johnny Ohlandt remembers when an angler finding a hot spot would load the boat with far more fish than he could eat, freeze or give away. Over the years, concerted outreach efforts by Marine Resources Division staff members promoting catch-and-release fishing have convinced many anglers to concentrate not on the harvest, but on the sport, the experience and enjoyment of being on the water with family and friends, leaving most fish to reproduce so that their children and grandchildren can have the same angling experience. Today, some red drum anglers release every fish they catch. Most coastal fishing guides do not allow their clients to keep any fish, or at most, just enough for supper. In 1975, the Marine Resources Division started a program that provided tagging kits free to marine anglers. 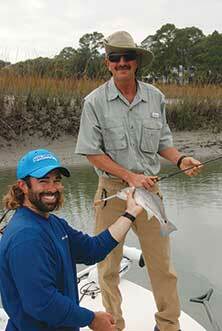 Anglers began to enthusiastically tag and release inshore and offshore fish. From 1975 to 2003, Johnny Ohlandt tagged hundreds of red drum, keeping meticulous notes on the size and location of each catch. He also noted the many fish he caught more than once, mostly in just about the same location - one, amazingly, after five years. "In this age of information, anyone can instantly publish experiences and opinions that can influence public perceptions without any real facts," said Deputy Director Robert Boyles. "One guy catches a mess of fish, sends out a blog and suddenly some anglers may think the whole population has recovered. We have to compare our personal experiences to the rigorous scientific data generated by the Marine Resources Division's research and monitoring efforts." Since red drum and many other coastal fishes move freely across state lines and have large ranges - red drum range from New England south all along the Atlantic Coast and into the Gulf of Mexico to Texas - state by state regulation makes little sense. Decades ago, a number of states formed the Atlantic States Marine Fisheries Commission to oversee management of coastal fish species. The ASMFC, which meets quarterly, has three members from each state. Boyles serves as one of South Carolina's representatives. 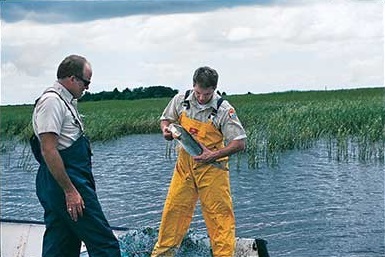 The commission sets guidelines for the harvest of coastal fishes such as red drum. 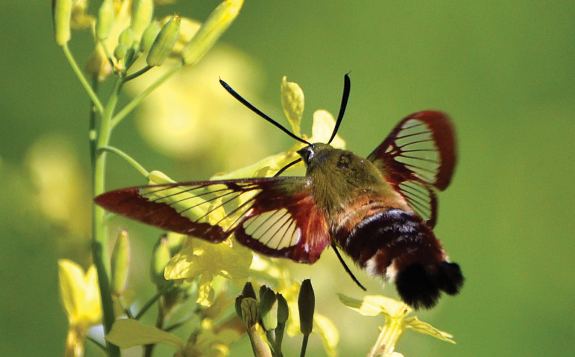 Each member state can establish its own size and catch limits within that framework, creating a regional strategy to protect and enhance commercially and recreationally important species. Most South Carolina red drum anglers seem pleased with the access they now have to this well-managed species, but realize that some years will be better than others based on annual spawning success. Health problems keep Johnny Ohlandt from fishing these days, but he says he still enjoys eating red drum given to him by friends and family. He also feels good that red drum, after years of research and management, have now reached a stable population. "Something about bass has always fascinated me," said Ohlandt, voicing the sentiments of many coastal anglers from Massachusetts to Mexico. "I love those fish." 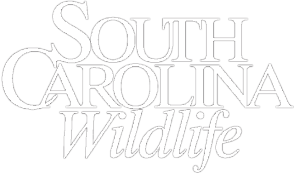 Longtime SCW contributor Pete Laurie lives on Johns Island.